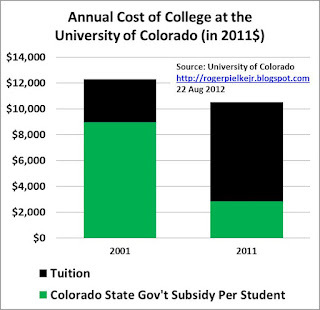 Writing in the Wall Street Journal over the weekend, Scott Thurm took an in-depth look at the University of Colorado, where I am a professor, as an case study in how state governments are moving out of the business of subsidizing university attendance for their residents. For generations of Americans, public colleges and universities offered an affordable option for earning a college degree. Now, cash-strapped states across the country are cutting funding for colleges and directing scarce resources to primary and secondary schooling, Medicaid and prisons. That is shifting more of the cost of higher education to students and their families. Public higher education in the U.S. dates to the 1795 establishment of the University of North Carolina. In 1862, Congress passed the Morrill Act, which gave land to the states to establish colleges "to promote the liberal and practical education of the industrial classes." The 108 so-called land-grant colleges still form the backbone of the U.S. public higher-education system. Public-college enrollment exploded after World War II and the adoption of the GI Bill. As recently as 1951, more Americans were enrolled in private universities than public ones. Sixty years later, more than 15 million students were enrolled at the nation's 678 public colleges and universities, nearly three times the number attending private ones, according to the Education Department. These data clearly illustrate that over the past 40 years, the costs of a college education in Colorado for resident undergraduate students has fundamentally shifted from the majority of the expenses funded by taxpayers to the majority now funded by students. As Colorado State University System‘s Chief Financial Officer Richard Schweigert pointed out, "We are cost shifting to students—that is all we are doing due to the state basically ignoring its 'economic engine‘—higher education." This shift has occurred not only due to increasing costs to provide postsecondary educational services but also due to limits of the state‘s general fund to support student growth and other demands on the state‘s general fund. Such a change has had a profound impact on the equation of public funding and the state policy that was in place in 1980 when the student was expected to pay 25% of the cost of an undergraduate education while the state covered 75%. This equation, for many public institutions in Colorado looks more like the equation in Figure 4.14 than it did in 1980, where in some cases today, students are paying approximately75% of the cost of their education while the state support has declined to just 25% of the cost. State subsidies for these public colleges and universities fell 21%, on a per-student, inflation-adjusted basis between 2000-01 and 2010-11, according to the State Higher Education Executive Officers Association, a national research and advocacy group. Over that same period, tuition at two- and four-year public colleges rose an inflation-adjusted 45% to $4,774 in 2010-11, according to the association. At public four-year colleges this year, tuition averages $8,655, according to the College Board. But education experts say wrenching decisions on the state level about how to allocate limited public resources are having a very big effect. The results are a more market-oriented campus which has both positives and negatives. On the positive side, the market incentives help to motivate innovation and performance, with a focus on meeting the demands of students. On the negative side, the push for pure economic value leads to what arguably pathological responses, such as the emphasis on "cash cows" in the form of international or out-of-state students willing to pay extra to attend a state school. CU has long attracted lots of out-of-state students, who pay higher tuition. Non-Coloradans currently pay $31,559 for tuition, not counting room and board. The higher nonresident fees go "a long way toward keeping the lights on," says Mr. Gleeson. In 2010, officials persuaded lawmakers to exclude foreign students from the cap on out-of-staters—currently 45% of freshmen—arguing that the foreigners would add more global perspective. But they also covet the additional revenue, which officials estimate at $30 million a year. This year, CU is dispatching recruiters to more than a dozen countries, from Latin America to the Middle East. Others are pursuing the same strategy. At Purdue University, 17% of undergraduates are from outside the U.S., mostly from China, up from 9% in 2009. At the University at Illinois, 13% of this year's freshmen are foreign students. None of these various arguments will be news to long-time readers of this blog. If we are smart, then the end result of this wrenching process will be to do away with the two-tiered in-state/out-of-state tuition system -- which is a fiction -- and move to a market-based approach. The state subsidy for in-state students need not go away, as the state government could still cut a check for in-state students and send it to them directly. Further, a levelized tuition model might not make sense for every state university, but it almost certainly does for flagship campuses. The de facto privatization of state universities is likely to continue. Profound changes are likely to be coming down the road, as business as usual is no longer an option.